Please Note: We are moving to no phone, no internet area (read new home!) this week, all by ourselves, I won’t be able to answer to any of your emails for next 2 weeks till we get time to breath easily :) Please keep sending your MLLA entries and I will reply to all your emails/questions/queries as soon as we get broadband connection and settle down in our new home. Till then, Happy cooking and blogging! 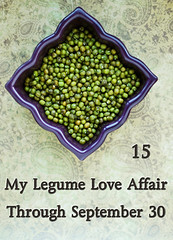 Regular visitors of my blog know my ever going, never ending love affair with legumes. So when Susan, a lovely blogger and splendid photographer behind the delightful blog called The Well Seasoned Cook, invited fellow bloggers to host her monthly event My Legume Love Affair sometime last year I jumped at the opportunity to host it. 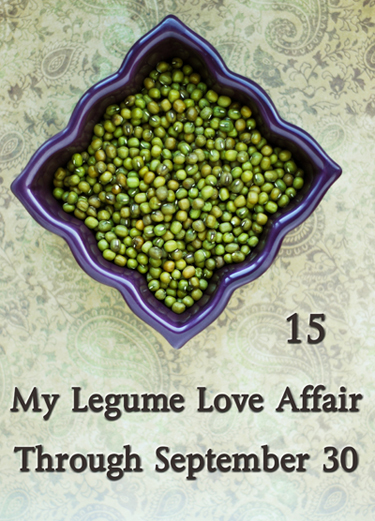 So here I am, inviting all dear bloggers and non-bloggers to participate in this month’s edition of My Love affair with Legumes-Fifteenth Helping. A legume is a plant in the family Fabaceae (or Leguminosae), or a fruit of these specific plants. A 'legume' fruit is a simple dry fruit that develops from a simple carpel and usually dehisces (opens along a seam) on two sides. A common name for this type of fruit is a "pod", although pod is also applied to a few other fruit types, such as vanilla. Well-known legumes include alfalfa, clover, peas, beans, lentils, lupins, mesquite, carob, soy, and peanuts. So for this event we are concentrating on pods like the ones listed in this page and not the plant. Please make sure that you follow the guideline listed below in order to be eligible for the lovely prizes. Yes, there will be not just one or two but three fabulous prizes. One lucky winner will receive two fabulous books specially selected by Susan and a gift from Hurst Bean. The first book is Remembrance of Things Paris: Sixty Years of Writing from Gourmet (Modern Library Food) by Gourmet Magazine Editors and Ruth Reichl and the second one is Gourmet Indian In Minutes: Over 140 Inspirational Recipes by Monisha Bharadwaj and they will be shipped worldwide. The third prize is a case of six bags of your choice of Hurst Bean products, suitable for every diet, generously provided by Hurst Bean. Due to shipping restrictions, this prize can only be awarded if the winner is a U.S. resident. Prepare any vegetarian/vegan recipe with legumes as the star ingredient. Any cuisine, any course is acceptable as long as it features legumes. For this time I am restricting the entries to only vegetarian and vegan recipes but recipes with eggs are allowed. Dedline for the event is 30th September ’09 and please note that late entries will not be included in the round-up. Please provide a link to this announcement page and to Susan’s event page. Send a mail with MLLA in the subject line to sia[at]monsoonspice[dot]com with the following details. An optional photograph of the final dish that is resized to 400 X 300 (in pixels) or 300 X 400 (in pixels) depending on orientation. If you don’t have a blog but would like to participate, send an email with the recipe and the above-mentioned details and your entry will be included in the prize draw. Use of logo is optional. You asked for it and you have got it coming right up with my first post this month:). I love legumes! I look forward to see these recipes! Happy Hosting.Will surely send.Love the lovely logo. Sia, I'm sure with Dassera around you are about to be bomborded with MLLA posts. Hoping to send few. This is very healthy and Nice event..Sure will send some entry to you. My Moongdal Upma is on its way to your event. Happy Hosting. I will think of something for the event. Nice event! Will make a comeback to blogging with an entry for your event - this time, I mean it! :) Looking forward to the roundup already! Love the event, happy hosting sia! First time here, love your blog..! Will follow..! Do check my blog.! My blogpost is on the way to your inbox..It is so exciting to participate..
Lovely event MLLA... Will definitely send across something..for the event. First time here... Happy Hosting Sia !!! Hey absolutely LOVE ur blog..have posted my recipe for the event..but am not sure if my mail went thru..should i resend it..?? Looks like a lot of fun. Looking forwarding to entering a dish. I have sent my entry!! Hope u got it. I have sent emailed you my entry for this event! Thanks for the warm welcome.I have mailed you my first entry. Just sent an entry for this beautiful event - hope you have received it !